Simone Dinnerstein will make her BSO debut with us, playing Mozart's Piano Concerto No. 23. I have heard that her playing is wonderful. By the way, she also happens to be a beautiful young woman. Today she has an interview on WAMU's Kojo Nnamdi show at 1:30 pm. Listen live at wamu.org! Should be very interesting. We will also perform Haydn's Symphony No. 44 and Beethoven's 4th Symphony. I love the 4th: it isn't performed as frequently as many of Beethoven's others, but it is a great piece. The outer movements are lots of fun, and the slow movement is gorgeous! Coincidentally, my son Stephen, a student a Yale University and an aspiring conductor, will be conducting a student orchestra in Beethoven's 4th Symphony this Saturday evening, too. We will be comparing notes, I'm sure. Have you ever fantasized about playing alongside Emily Skala on flute, or perhaps thought about sharing some nice harmonic support with Chris Dudley in the brass section? Well, here's your chance, but you'll need to sign up early on November 2. Last week we recorded Bartok's Concerto for Orchestra, a 20th Century masterpiece. 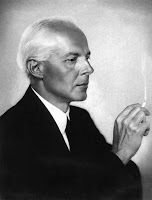 Bartok used folk elements in his music; he combined them with an amazing mathematical sense for structure. Bartok is rarely "easy listening." The first time I heard a Bartok string quartet I thought it was noise. The music becomes intelligible when the listener can grasp some of the unusual harmonies through repeated hearing. Marin showed Bartok's connection to Eastern European folk music and its harmonic language by having the group Harmonia perform on stage before the BSO played the Bartok. The Concerto, like most music Bartok wrote, is a very difficult piece. I think that, with lots of good practice and four performances, we were able to do it justice. In June we will record another piece by Bartok, Music for Strings, Percussion and Celeste. Eventually we will release those two pieces together on a CD. This week Jack Everly returns for his always entertaining Pops programs. The program this week is "Hollywood: The Epics," and the Baltimore Choral Arts Society will be performing with us. Come have fun with Jack and us this weekend!